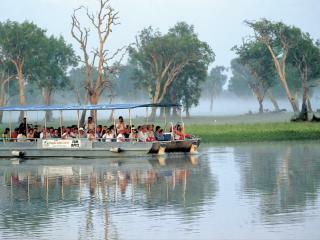 Experience the best of the Kakadu National Park with this 2 day accommodated tour from AAT Kings. Visit ancient Aboriginal rock art at Nourlangie and Ubirr, search for saltwater crocodiles as you cruise the Yellow Water Billabong, join the Guluyambi Cruise along the East Alligator River and with special permission of the local people, go ashore in Arnhemland. You will also visit the Warradjan Cultural Centre and the Bowali Visitor Centre to view informative displays of the Aboriginal People in Kakadu. This 3 day Kakadu & Gunlom Falls Adventure Tour from AAT Kings takes you to some of the most amazing sights of the Kakadu National Park. Go on Aboriginal guided walks, view ancient rock art at Nourlangie and cruise along the Yellow Water Billabong in search of saltwater crocodiles. You will also get to experience the sheer beauty of the world famous Gunlom Falls, cruise the East Alligator River, and view informative displays at Warradjan Cultural Centre. 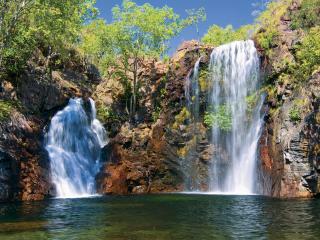 Immerse yourself in the wilderness of the Top End on this 3 Day Kakadu & Katherine Gorge Tour with AAT Kings. Visit some of the most popular sights of Kakadu and Katherine including the ancient Aboriginal rock art Nourlangie Rock, see saltwater crocodiles on the Jumping Crocodile and Yellow Water Billabong cruises, swim in the natural pool at the base of Edith Falls, and view exhibits depicting the traditions of the Indigenous People at Warradjan Aboriginal Cultural Centre. Spend 3 days with AAT Kings on this Kakadu & Litchfield National Parks Tour, seeing the sights of some of the Top End's most popular destinations. Take a guided walk to Nourlangie Rock to view ancient Aboriginal Art, cruise the Yellow Water Billabong in search of crocodiles, visit the Warradjan Cultural Centre, and go ashore in Arnhem Land. You will also have the chance to swim in large crystal clear rock pools, see magnificent waterfalls and take photos of the amazing stand of termite mounds. This 4 day Kakadu, Arnhem Land & Gunlom Falls Adventure tour takes you through the most popular attractions of the Northern Territory's Top End including the Kakadu National Park, Aboriginal rock art of Nourlangie Rock, flora and fauna of the Yellow Water Billabong and Guluyambi Cruises, Arnhem Land, Mikinj Valley, Gunlom Falls, Warradjan Aboriginal Cultural Centre and more.